I feel myself beginning to withdraw. Although I do realize that this is the normal time of year for melancholy, I find myself spending a little more time at home, sorting out closets, cleaning drawers, etc. I am wholly blessed with teeny little bottles of personal cleaning products. My illness began years ago, when we were students. Back in the time when the call of “Free Pizza” could tempt us from three counties away and we lived on grocery store ramen soup mixes — at 19 cents each, and if you stir in an egg….well, hey! That’s protein! I would, upon checkout, tuck them into my bag. This seemed like an innocent-enough obsession, or so I thought. I thought to myself, time after time, ‘well, I did pay for them…’ and so it would go, me thinking to myself that perhaps I would need them someday. Perhaps there would be a time that I wouldn’t have time to get any shampoo, would not be able to afford shampoo…so I was saving them for a rainy day — sort of like my grandfather and his post-Depression pencil stubs. Yellow and pink and blue — the colors of petty crime. I wouldn’t exactly say that I am a criminal — I am only guilty of foamy infractions. But to open up the drawer to see it overflowing with samples — let’s just say that I have a serious addiction. Why is it that I think that I never have enough? Why is it that my mother-in-law used to fold up sandwiches in napkins, hiding them in her purse, only to forget about them? Why did my father save styrofoam and bubble wrap and why oh why oh why was there ever a need for a reality television show called Hoarders? This obsession is ultimately about trust and fear. Let go of these pencil stubs. Life will offer me a way to express myself. Release these sugar packets — my life is already filled with sweetness. Share the bubble wrap and styrofoam…I feel safe and protected without them. Let go of old, outmoded ideas, clutter, things we no longer need. Trust that we will have what we need. 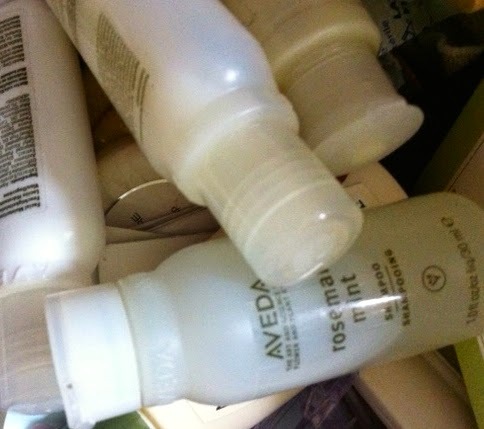 I am packing away the itty bitty bottles to repurpose…. trusting that I will be able to wash myself and my soul anew. I will be able to start again.